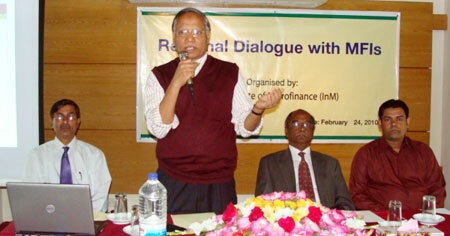 InM organised a day long dialogue with the MFIs of Chittagong Division on 24 February 2010 at BRAC Training and Resource Center, Chittagong. Over a hundred of top management members from 95 microfinance institutions of Chittagong region participated in the occasion. Dr. Md. Mosleh Uddin Sadeque, Interim Executive Director, InM, chaired the ceremony. Prof. M. A. Baqui Khalily, Department of Finance, University of Dhaka and the former Executive Director of InM was present there as Chief Guest. Abdul Hye Mridha, Deputy Director (T & Admin. ), InM, moderated the event. Professor Baqui Khalily gave a welcome address to the representative of the MFI’s and introduced InM and its different activities. Dr. Muhammad Abdul Latif, Director (Research & KnM) gave a short description of the research work of InM. This was followed by Dr. Sadeque’s presentation on the training and knowledge management activities of InM. Mr. Md. Abdul Hye Mridha also gave a short introduction on the importance of regional dialogue and expected outcomes from it. The dialogue was participatory and lively. Many important and timely issues were discussed in the dialogue focusing not only on concerns related to MFIs of Chittagong region, but also on the microfinance sector of the entire country.